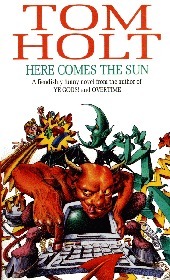 Here Comes the Sun, Tom Holt, Orbit, 1993, ISBN 9781857231250, 282pp. I still like Holt, but he’s starting to wane. This is mainly because he is moving away from the Wodehouse/Benson situational type of humor to the Pratchett one-liner & pun type. No, that’s not quite the description either. What Holt has been missing in these last few books is a simple coherency of plot. The plot is there, but rather than following one or two characters (Wodehouse tends to follow only one, the viewpoint character), Holt has taken to Douglas Adams-ing and going from direct narration by an omniscient and wise-cracking author to a maniac movement between three or four viewpoint characters. Is it funny? Yes, but the funny is a quick, brisk kind rather than the slow build-up. Here Comes the Sun is mainly a sendup of bureaucracy. What if the universe were actually one big machine, that required drivers and mechanics for the sun, regional planners for weather, an idiot administration (there is, of course, no other kind of administration, so I guess that’s an oxymoron), and the long- suffering support staff. Well, I can imagine it, and I think my imagination would cast it as a horror novel rather than as a comedy. I think Here Comes the Sun worked better than the even-more maniacal Overtime, but I’d like to pass Holt some virtual valium and hope for a book more like Goatsong the next time around.